Bore mm - Thickness (in. ): 84mm - 0.070" 84mm - 0.080" 84mm - 0.120" 84mm - 0.140" 85mm - 0.050" 85mm - 0.060" 85mm - 0.070" 85mm - 0.080" 85mm - 0.089" 85mm - 0.098" 85mm - 0.120" 85mm - 0.140" 86mm - 0.060" 86mm - 0.070" 86mm - 0.080" 86mm - 0.120" 86mm - 0.140" 87mm - 0.060" 87mm - 0.070" 87mm - 0.080" 87mm - 0.089" 87mm - 0.120" 87mm - 0.140"
Our VAC M50 / M52 Multi Layered Steel Head Gaskets are designed to withstand much higher combustion pressures than any OE factory head gasket, as well as other conventional or modified head gaskets. Made to the finest specifications and run all around the world on the street and in various motorsports; they are made from a minimum of 5 layers of which the outer layers are coated with a patented type of material to ensure proper sealing of fluids. This design ensures a complete combustion chamber seal and elimination of failure due to weak factory gaskets blowing out under boost or high performance use. 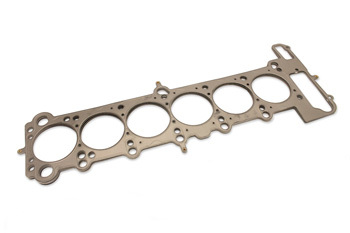 These gaskets are available on a variety of thickness' from as thin as .024" up to .140". We use these gaskets on every engine we build. Silicone or gasket maker should be used along with these gaskets in the timing cover areas - copper spray on the top of the gasket is OK but not needed. For best possible results, your cylinder head mating surface should be cleaned and professionally resurfaced to an Ra of 50 or finer. good for no rush projects. From Justin Allen of Baltimore, Maryland on 8/30/2013 . From Paul Gamelin of Canterbury, Connecticut on 4/20/2013 . From H.Amin of Springfield Gardens, New York on 10/28/2012 . From azraelracer of Lima, Ohio on 3/26/2012 .